Joker's Training Journal: Fight Training "Weird Science"
Again by inspection we can see that there are many more pure knockouts in round 1 than in rounds 2 and 3 combined. 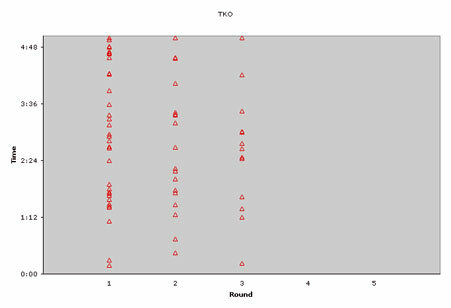 There is also a greater clustering toward the beginning of the round in the first round compared to the subsequent rounds. Submissions due to strikes can occur at any time more probably in the second round, but are a rare form of victory. 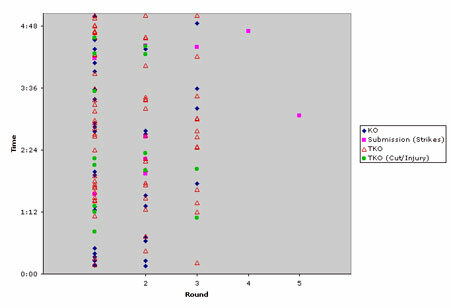 Technical knockouts are universal throughout the three rounds with a slightly greater incidence in round 1 than in 2 or 3. Cuts and injury-based TKOs are more prevalent in round 1 and can also occur quite early. So what's going, well first knockouts can happen at any time but are more likely to occur early in the fight than late. Thus knockouts are probably occurring due to a combination of poor warm-up, protracted "feeling out" process by one fighter, "nerves", and fighter mismatch. The later knockouts are probably an effect of attrition and fatigue causing a fighter to be unable to defend or reverting to poor stand-up guard. Victory by submission due to strikes are spread but occur over a third of the time in round 2. One conjecture is a battered fighter in round 1 attempts to mount an offense in round 2 and is again out punched. Alternatively these are matches with more ground work or level changes and have an increased fatigue factor. TKOs are universally prevalent but are tainted data since they are secondary to referees judgment. However, they still occur earlier and more often in round 1. This could be a similar effect as the knockouts above, with the added confounder of a referee's interpretation of events. The relatively more even distribution throughout the rounds of TKOs compared to KOs is probably an effect of attrition and fatigue, as the the fighter tires he will be less coherent and cognizant due to both being exhausted and due to repeated strikes. TKOs due to cuts or injuries are also more prevalent early rather than late which can also be a function of poor warm-up, protracted "feeling out" process by one fighter, and "nerves". However it is more than likely that inadequate warm-up is a key factor here, a sweaty fighter is more slippery and harder to cut. However as they are more warmed-up they should be well perfused and, if cut, bleed more. Perhaps due to rapid high volume loss the concentration of clotting factors/platelets is increased, minimizing bleeding. Interestingly no championship (5 round) match has ended by KO or TKO in rounds 4 or 5. It is curious with the abundance of TKOs none occur in rounds 4 or 5. This paucity of KOs and TKOs in later rounds is probably either due to fighter mismatch eliminating fighters in earlier rounds, two elite fighters will not have a quick ending to their fight and will stymie one another all the way to the decision. My hypothesis was a little off, the data seems to support round 1 knockouts and TKOs due to cuts or injuries are both more prevalent and happen early in the round than in rounds 2 or 3. Finished with 5 minutes on the ground. First, a return to "no man's land" -- I like delivering combination and then exiting, however if you are caught during your exit you must react. For example, you enter, deliver combo X, and retreat but I return a cross which you have to be defended with a cover. You've been caught in "no-man's land", reaction is demanded both in the judges' eyes and to punish this indiscretion. In other words if you are being struck evasion has failed. Covering is the next option and a cover is coupled with advancing (cutting striking leverage) followed by reaction. Next, the concept of stymieing, or shutting down an opponent's game. If something I do works, I'm going to keep doing it until my opponent stops it or loses. But if my opponent stops what I do, I may try throwing it again...a few times, but I'll most likely stop because I'm being scored on, hurt, or losing. Thus a multidimensional fighter must stymie an opponent's game but be adaptable enough to switch strategies when one arsenal is made useless.